One of New York’s most celebrated restaurants is back and better than ever. I thought it could never be done. 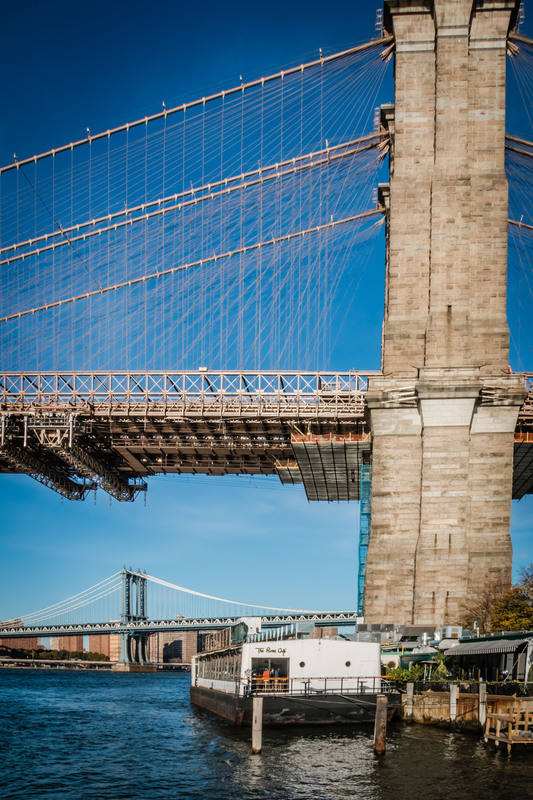 It was a sentiment shared by pretty much everyone after The River Café in Brooklyn took a devastating hit from Hurricane Sandy in 2012. 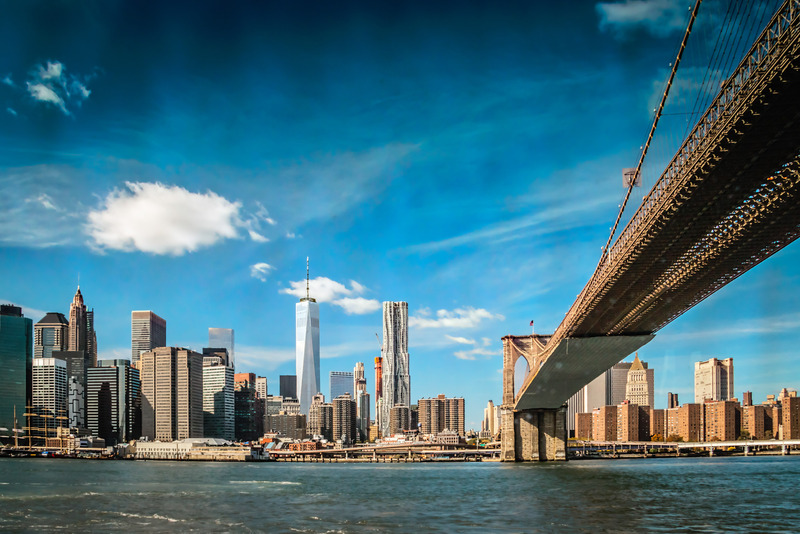 The restaurant opened in 1977 aboard a riverboat that was moored to a quaint coach house on the bank of the East River, just beneath the Brooklyn Bridge. 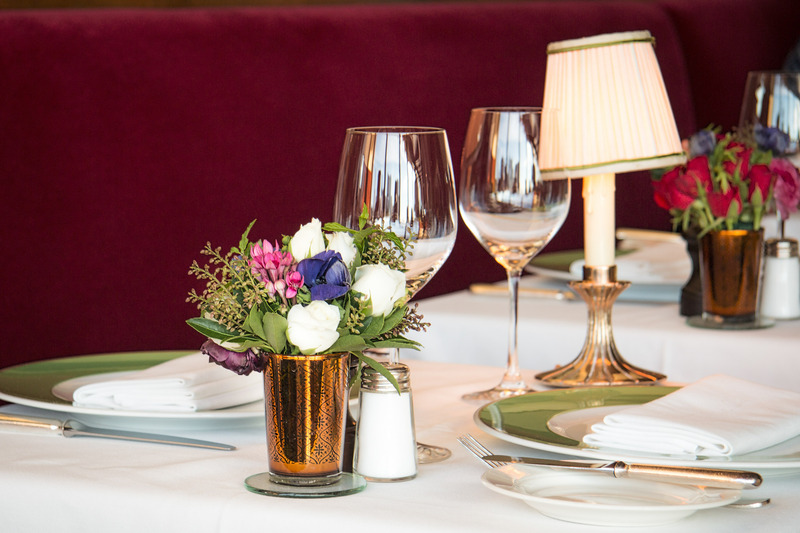 With breathtaking views of the Manhattan skyline, the restaurant radiated glamor and exclusivity. Over the years, its kitchen launched a succession of soon-to-be legendary chefs, including Charlie Palmer, David Burke, Larry Forgione and George Morrone. But then came Sandy. The hurricane swept in like a wrecking ball and filled the restaurant with four feet of water and gunk. The wine cellar, one of the best in New York, was decimated. If The River Café was going to reopen, everything would have to be replaced: the tables and chairs, the oak bar, the floors, the grand piano, the interior walls, the wine, the kitchen. So be it. That’s exactly what happened, and then some. Owner Michael O’Keeffe must have spent a fortune on the museum-quality restoration. In early 2014, after being closed for more than a year, The River Café reopened. From the looks of it, you would never know it had been closed, or even damaged. Everything is just as it was: the polished wood floors, the tuxedo-clad waiters, the scent of fresh roses and lilies, the antique Pulsynetic clock, the potted palms, the Steinway piano with the same piano player who’s been providing the romantic soundtrack here for decades. Brad Steelman, the chef in charge when the hurricane hit, is also back at the helm with a brand new kitchen. He seems particularly inspired these days, as if it’s almost his turn to leave and become even more famous. 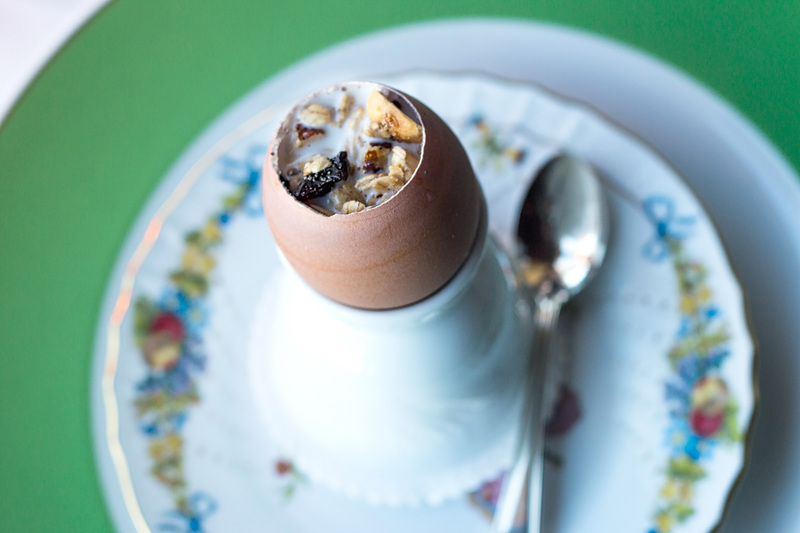 At brunch recently, my meal begins with an amuse bouche, an eggshell stuffed with silken banana flan and walnut granola. It is so delicious that I worry whether the rest of the meal can possibly live up. It does. I enjoy a poached and fried duck egg encrusted with breadcrumbs, its yolk as gelatinous and creamy as custard. The egg is served in a sauce made with foie gras and topped with rings of tiny onion that have been pickled in Sauternes wine. 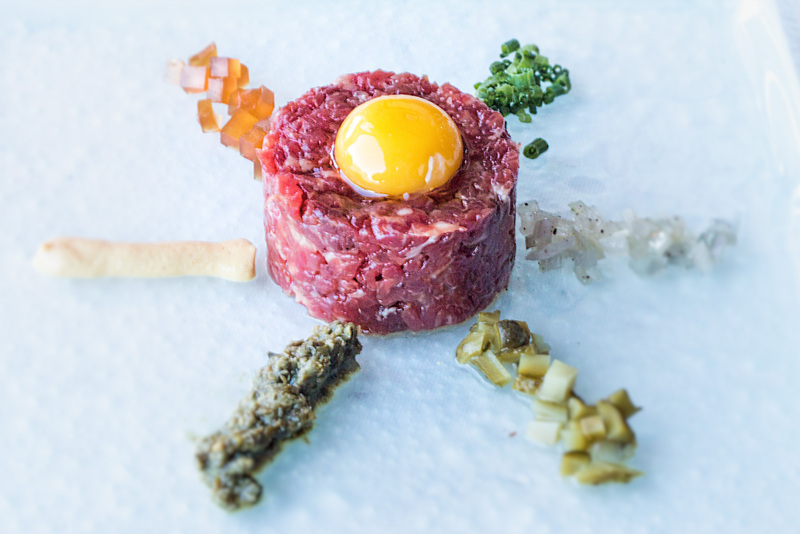 A waiter prepares the wagyu beef tartare tableside, mixing the hand-cut steak with olives, onions, Cognac gelée and a quail egg. 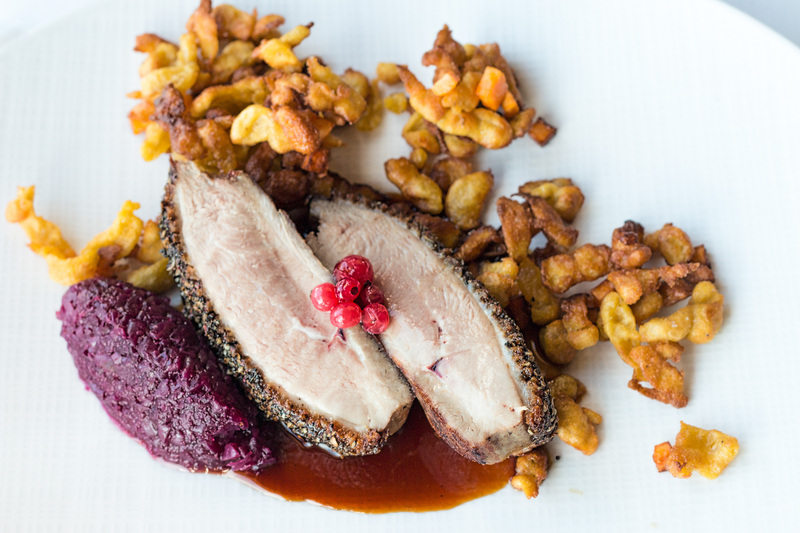 Breast of duck is beautifully encrusted with lavender and black pepper and roasted until the bird’s fatty skin is perfectly crisp. This is accompanied by fresh red currants on the vine and a delicate duck jus, along with sweet potato spaetzle and a quenelle of pickled cabbage. 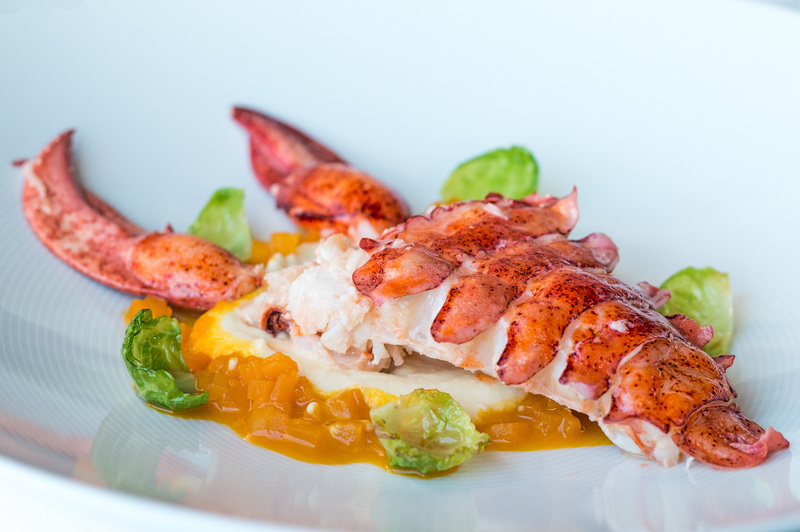 Lobster is removed from its shell so precisely, and then so painstakingly reassembled on the plate, that it projects the optical illusion of still wearing its armor. 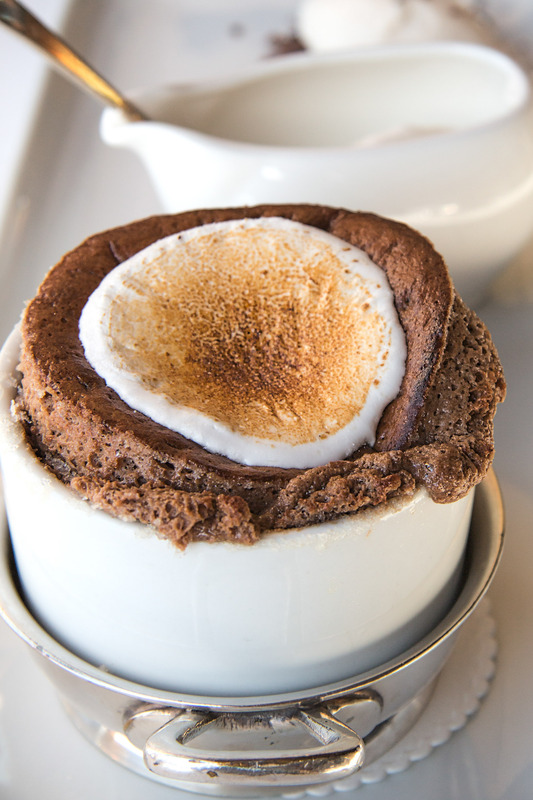 And I seriously doubt that anyone has ever baked a more perfect chocolate soufflé than the one here, which is topped with a dollop of toasted marshmallow that slowly droops into the molten center like Salvadore Dalí’s famous melting clock. The River Café is definitely, timelessly back.